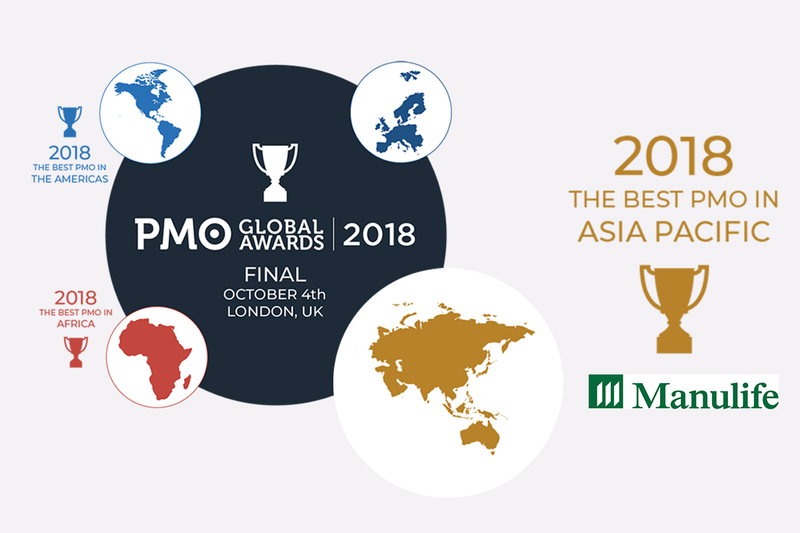 This month we spoke to Leyton Brownlie who is Head of the Regional PMO at Manulife Asia to give us an overview of their PMO and how his team won Europe’s PMO of the Year in the PMO Global Awards 2018. PMO people like detail so we thought we would start with an overview of the Manulife Asia PMO. Manulife Financial Corporation is a leading international financial services group that provides financial advice, insurance, as well as wealth and asset management solutions for individuals, groups and institutions. They operate primarily as John Hancock in the United States, and as Manulife in Canada and across Asia. Manulife is one of Asia’s largest life insurance companies and has been serving customers for more than 130 years. We operate in 12 markets in Asia, have 12 000 employees, 73 000 agents and manage assets of more than US$133bn.Today, we are working on becoming a digital, customer-centric market leader, focused on helping people make their decisions easier and lives better. Leyton expands on the background of their PMO “Back in 2016 we had limited maturity across our PMOs in Asia. We had a heavy reliance on our global PMO based in Canada for fundamentals like governance, funding approvals, project management framework and supporting policies. We had ad-hoc ways of working across our PMO and project delivery across our businesses. As a result, almost 80% of projects were not completed successfully, with inconsistent standards and failing audits. We started the journey to set up a professional PMO organisation started in 2017. A Strategic PMO and Country PMOs, with local and regional governance was established to be able to manage programmes in a structured way. That same year another milestone was achieved – the roll-out of a Portfolio and Project Management (PPM) platform across all our markets within five months with a focus on portfolio management, project planning and execution and resource capacity planning. The PMO has been an incredibly important part to the organisation, Leyton explains what they are most proud of. “We are most proud of the improvement we have made across portfolio management and reporting as well as the tools and techniques we have implemented for our delivery teams to drive execution excellence in project delivery. Finally, we wanted to ask Leyton about the advice he would give to other PMOs to inspire them to have a successful PMO. “Experience has taught us that on any journey to delivery excellence, taking a structured change management approach is essential. We have followed our proven project and change management steps, to build a re-shaped PMO that has been fully accepted by the team and the organisation. Our approach is based on the understanding that, for change to be successful, people must be at its heart. Key to our success has been our change management and communications approach. We have engaged our stakeholders through the full change journey from identifying, delivering and managing the change through to successful outcomes. The Global PMO of the Year will be announced at FuturePMO on 4th October in London. At the conference Bianca Ilibasic who is Head of Transformation will be representing Manulife Asia and telling us more about their story and how you can incorporate some of their successes into your day to day. She will be supported by Leyton Brownlie. You can learn more about the PMO Global Awards HERE. Book your tickets to hear from the best PMOs in the world now!